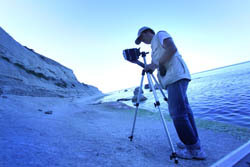 David Pisani is one of Malta’s foremost photographers and has gained a formidable reputation well beyond Malta’s shores. He lives in Valletta, where he has always had a bolt-hole even during his time living in Paris. Valletta was the subject of his lens for well over twenty years and many of his photos of the city, documenting its changes, were chosen to form part of the French National Collection. He is renowned for his works capturing buildings and cities – Vanishing Valletta, and Dubai. But we speak to him about his latest work on Malta’s seascapes and coastline, entitled ‘A Sight to Sea: Coastal Recollections’ that was commissioned to inaugurate a new gallery opening soon. Q: You’re renowned for your work photographing buildings – Valletta and Dubai. Do you feel seascapes are a departure for you? A: I had long been considering a photo essay on the Maltese coastline, prompted by the fact that the Islands were threatened by over development and that many places I knew as a child had succumbed to the forces of so-called economic progress. However I have never been an eco-militant nor politically motivated in my art and the whole idea seemed somewhat contrived. Early in 2009, both my parents passed away within weeks of each other and as the process of grieving took hold of my senses I was drawn back to the coastline and to the memories of the seemingly endless summers spent with my parents and my brothers. As a new urge to document these places began brewing inside me it became clear that what I was trying to photograph were the memories, or the mental and emotional images I had of the coastline, and not a systematic documentation of “what’s left”. 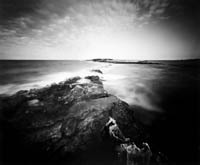 From this came my decision to shoot on a Zero Image 4×5 pinhole camera and to produce a series of images that reflected what I felt, rather than what I saw. Yet, despite my apparent avoidance of any political involvement it soon became clear that my images also became a testament of what the pristine Maltese coastline looks like today, and what it may one day look like only in our minds as a distant memory. Q: Much of your work is devoid of people (as in your series and book entitled ‘Vanishing Valletta’). Is there a pattern to this love of the blank canvas? A: A critic once said of my work that by eliminating people in the flesh I actually described more of the human condition in my work than images which include people and faces. I’ll buy that! 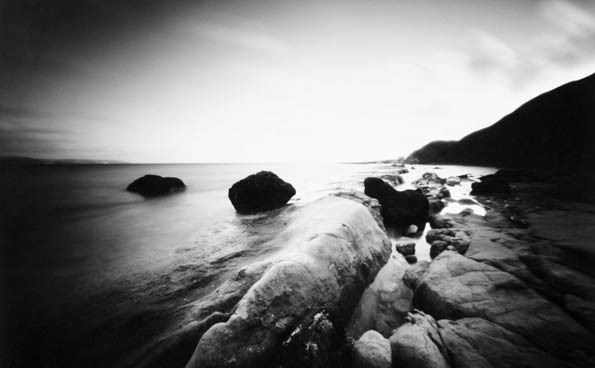 Q: How different a challenge are seascapes to photograph? A: Not very different from architecture; you work alone, often early morning or late evening…you wait and wait for the right conditions. In the case of seascapes, the wind also determines how the image will look. The sea’s character is traced in the waves, like lines on a face…and every day is a different face. I could shoot the same spot every day over a decade and each time I would get a different image. Ultimately though, I can only photograph successfully those subject I am personally attached to. Q: Having spent many years in France, and also shuttling from Malta abroad, is the sea something that draws you back to the Islands; something inborn that you miss when away? A: I can’t say that I miss the sea when I’m away, or that the sea would make me want to return to the islands, but anyone who is born by the sea has a special relationship with this element, just as people born in mountainous regions have a special understanding of those landscapes. A: The gallery is owned by Joseph Gauci, my agent in Malta, who was responsible for the Vanishing Valletta Exhibition. He has been in the business for several years and with SO Gallerie he can now showcase his art collections and visiting artists in his own private space. He asked me to inaugurate the gallery with my work so this collection was exclusively created for the event. Q: What can we expect of So Gallerie to come? techniques, media and styles it offers a diverse inventory of original works of art, often sourcing the works through personal contact with the artists themselves. Apart from the extensive inventory held on site, SO Galerie can provide tailor made art works by directly commissioning an artist to create a work to a client’s specifications. With a full calendar of openings and events, SO Galerie should attract a significant amount of patrons, often chosen from a select group of art collectors. SO Galerie forms part of the Picture House Group, an established firm in the supply and installation of high quality art display.